Radiotherapy is involved in many curative treatments of cancer; millions of survivors live with the consequences of treatment, and toxicity in a minority limits the radiation doses that can be safely prescribed to the majority. Radiogenomics is the whole genome application of radiogenetics, which studies the influence of genetic variation on radiation response. Work in the area focuses on uncovering the underlying genetic causes of individual variation in sensitivity to radiation, which is important for effective, safe treatment. In this review, we highlight recent advances in radiotherapy and discuss results from four genome-wide studies of radiotoxicity. Since the discovery of radiation at the end of the 19th century, radiotherapy has become one of the most important modalities for treating cancer. The schedules (total radiation dose, dose per fraction, number of fractions, overall treatment time and volume irradiated) have been developed to maximize tumor kill and minimize normal tissue damage. The radiation dose prescribed depends on the cancer type and surrounding normal tissue tolerance. Doses are generally given so that <5% of patients suffer serious toxicity up to 5 years following radiotherapy [1, 2]. Serious side effects such as bowel obstruction and incontinence can occur months to years after treatment, be extremely debilitating and impact negatively on the quality-of-life of cancer survivors. Given the millions of cancer survivors worldwide, estimated at 2 million in the UK and 12 million in the USA, there is a need to increase our understanding of the molecular pathogenesis of radiotherapy toxicity, find ways of predicting those patients likely to suffer with long-term side effects, and develop new approaches for their amelioration. As there is a direct relationship between radiation dose and tumor control, the development of side effects in a minority limits the dose that can be safely prescribed to the majority of patients. Development of a test to predict those likely to suffer side effects should enable individualized radiation dose prescription to increase cancer cure while reducing the number of survivors suffering with the consequences of treatment. In this review, we outline the current radiotherapy approaches and understanding of how this treatment works. Then we discuss toxicity and the importance of genetics. We then focus on recent developments in identifying the genetic variants underlying radiosensitivity and the results from the first genome-wide association studies (GWASs), which suggested that a polymorphism in the follicle-stimulating hormone receptor (FSHR) gene might be associated with erectile dysfunction in African-American men after radiotherapy for prostate cancer  and variants in PRDM1 with second cancer induction following radiotherapy for Hodgkin's lymphoma . Around half of cancer patients receive radiotherapy , with an estimated 40% cured by radiotherapy compared with 49% by surgery and 11% by chemotherapy . For some cancers of the head and neck, lung, cervix, bladder and prostate, radiotherapy can be used instead of surgery to achieve similar cure but with better functional results (for example, voice preservation for larynx cancers). For locally advanced cancers unsuitable for surgery, it is usually the only potentially curative option (for example, cervix). It is used neo-adjuvantly to shrink tumors prior to surgery (for example, rectal) and adjuvantly following surgery to target local microscopic spread of disease (for example, breast). As few tumors are cured by chemotherapy alone, improving the results of radiotherapy would impact significantly on cancer survival statistics. Radiotherapy outcomes are improving because of technical developments allowing better radiation delivery to reduce the amount of normal tissue irradiated. Further gains will require a better understanding of molecular mechanisms and personalized treatment based on an individual patient's biology. The two main approaches are external beam radiotherapy (EBRT) and brachytherapy. EBRT is used most widely and involves radiation delivered from a machine outside the body (usually high energy X-rays from a linear accelerator). Radiation is given from different angles by moving the linear accelerator gantry so that multiple beams converge on a tumor. 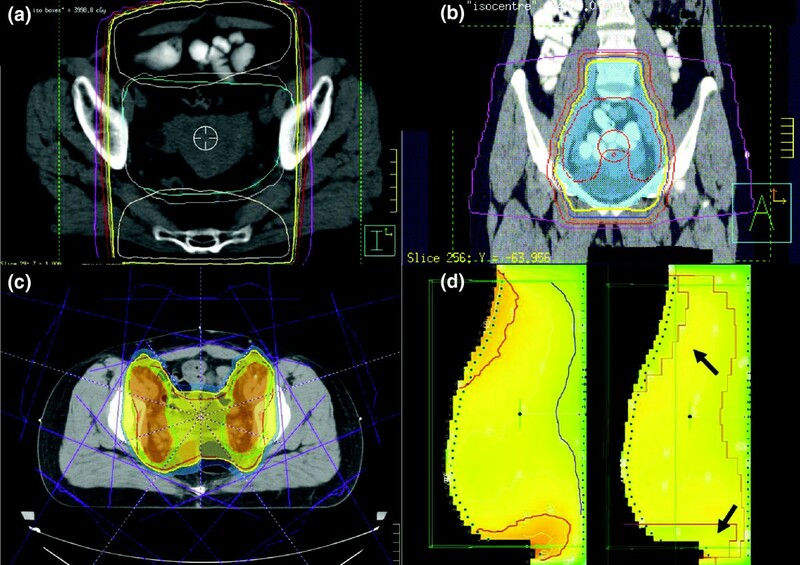 The area irradiated is determined by tumor imaging before treatment, and a target volume delineated to which margins are added to allow for microscopic spread and tumor movement. Until recently EBRT was planned in two dimensions and the radiation beam delivered from just a few angles (front and back, and sometimes both sides) with large box/rectangular fields including adjacent normal tissues (Figure 1). With the development of computed tomography (CT) and computers, tumors are now delineated in three dimensions using conformal radiotherapy where beams are shaped using metal plates (multileaf collimators) to shield normal tissue. EBRT is usually given as a course of multiple fractions, for example, 33 fractions of 2 grays (Gy; the standard unit of absorbed radiation dose) given Monday to Friday over 6 to 7 weeks. Fractionation maximizes tumor kill and minimizes normal tissue damage. The number and size of fractions are tumor type and stage specific but the schedules vary between centers and countries. Radiotherapy for cancer. (a) Treatment plan for a cervix tumor from 1990 with radiation delivered as two fields from the front and back - parallel opposed pair - with the gantry of the linear accelerator moving to deliver high energy X-rays from different directions. A large rectangular volume, including the central uterus containing the tumor, parts of the bowel (top) and the base of the spine (bottom), received the maximum planned dose. (b) Treatment plan for a cervix tumor from 2011 with radiation delivered as four fields (front, back, both sides) and multileaf collimators (metal leaves that move independently to block the path of the beam) to shape (conform) the maximum radiation dose not only around the large tumor but also to follow the lymph node chains where the disease had spread, while sparing as much normal tissue as possible. (c) Treatment plan from 2011 to treat pelvic sidewall disease following surgical resection for a cervix tumor. The intensity modulated radiotherapy was given as eight fields, with radiation intensity modulated along the beams using multileaf collimators to deliver the maximum dose to the tumor and to spare normal tissue. (d) Intensity modulated radiotherapy for a breast tumor. Examples of uneven radiation dose distribution using standard two-dimensional radiotherapy (left). The orange color depicts regions of unwanted high dose, superiorly and inferiorly. There is also an unwanted low-dose region depicted in green. Changing to intensity-modulated radiotherapy evens the dose distribution across the breast, as shown by the more homogeneous yellow color (right). Brachytherapy involves placing radiation sources (radioactive seeds, needles, wires, pellets) into the body, within or close to a tumor. It is the treatment of choice in some centers for some breast and prostate cancers, and in most centers for locally advanced gynecological cancers. Different types of radioactive material are used. Radiation is also given systemically for some cancers as part of standard treatment, for example, radioactive iodine for some thyroid cancers  and radioimmunotherapy (monoclonal antibodies conjugated with radionuclides) for some lymphomas . Technical developments are improving the delivery of radiation (Figure 1). One technique used increasingly  is intensity-modulated radiotherapy (IMRT), where doses are varied along multiple beams using multileaf collimators to allow shaping to concave targets [10–13]. Evidence for the benefit of IMRT is now compelling , for example, randomized studies showing that IMRT reduces toxicity in head and neck [15, 16] and breast [17, 18] cancer. Another new approach being introduced is image-guided radiotherapy (IGRT) [19, 20]. In IGRT, tumor motion can be tracked using radio-opaque markers implanted in or near a tumor. Changes in tumor position, size and shape during and between treatment fractions can therefore be monitored. This movement can be accounted for to improve the geometric accuracy of radiotherapy delivery and reduce volumes irradiated in shrinking tumors to spare normal tissues . There is an increasing diversity of IGRT approaches available from the different companies who manufacture linear accelerators. Stereotactic radiotherapy is a type of IGRT involving very detailed imaging and high radiation doses to small volumes. Proton treatment is being used increasingly, with more facilities becoming available worldwide. Proton therapy allows for high-dose radiation to be deposited very accurately at a fixed depth, and is particularly advantageous when the target lies close to critical normal tissue structure, such as in the treatment of the brain stem and in pediatric malignancies . Protons have also been used in the treatment of prostate cancer to achieve dose escalation while minimizing doses to normal tissues . When radiation interacts with tissue energy, deposition along a track causes ionizations (ejection of an electron from an atom; approximately 105 per gray per cell) with a clustering of ionizations at radiation track ends. Ionizations produce free radicals (atoms with unpaired electrons), which are highly reactive and can break chemical bonds. The most harmful effect to cells is damage to DNA, for example, single-strand breaks, double-strand breaks (DSBs) and DNA crosslinks. DSBs are the most important as they are harder to repair than other DNA lesions because the two DNA ends can separate, and accompanying base damage hampers DSB ligation . Unrepaired/misrepaired DSBs can be lethal/mutagenic. A single unrepaired DSB is lethal if it inactivates a critical gene or triggers apoptosis. Approximately 40 DSBs are induced per gray of sparsely ionizing radiation and most are repaired, with approximately one DSB unrepaired . There are two main pathways for repairing DSBs: non-homologous end joining (NHEJ) and homologous recombination (HR) . Figure 2 lists many of the genes involved. The two DNA repair pathways are complementary and are used in different situations. HR requires a homologous template, occurs during S and G2 phase (that is, in proliferating cells) and is error free . Alternative NHEJ pathways operate when the classical route is impeded (for example, due to a gene mutation) and they involve the MRN (MRE11-RAD50-NBN) complex important in HR, PARP1, XRCC1 and LIG1 or LIG3 . The MRN complex also controls sensing, signaling, regulation and responses to DSBs, including ATM activation. ATM phosphorylates Chk2, which targets Cdc25A for degradation, preventing its inhibition of Cdk1-Cyclin B and Cdk2-Cyclin B, leading to cell cycle arrest. ATM also phosphorylates p53 in response to DSBs. ATR is another protein recruited to DSB sites, and it signals via Chk2 to promote cell cycle arrest. Signaling via ATM/ATR induces apoptosis or cellular senescence if DSB repair fails. Chromatin structure is also involved and ATM/ATR/DNA-PK cause phosphorylation of the histone H2AX on chromatin alongside DSBs. Summary of the pathways and mechanisms involved in cell and tissue response to radiotherapy. The interaction of ionizing radiation with tissues leads to multiple types of DNA damage (for example, base damage, single-strand breaks, double-strand breaks). Double-strand breaks are harder to repair and are the most important DNA lesion induced by radiation. Radiation also produces reaction oxygen (ROS) and nitrogen (RNOS) species that stimulate cytokine, growth factor and chemokine responses. 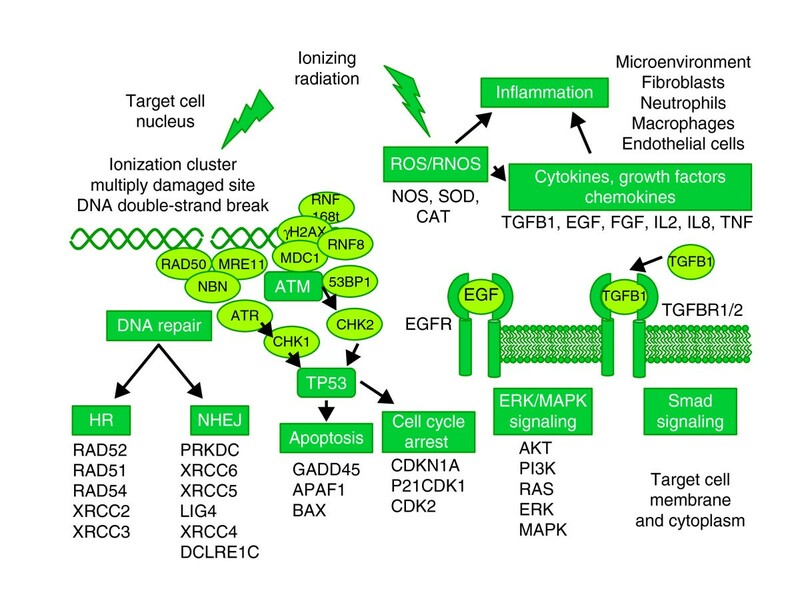 There are multiple interconnected signaling networks that respond to radiation damage that can lead to cell death, cell senescence, genomic instability, mutations and inflammatory response. Some of the key genes involved in the processes are shown. The information taken from Bentzen (2006) , Jeggo and Lavin (2009)  and Bhatti et al. . HR, homologous recombination; NHEJ, non-homologous end joining; NOS, nitric oxide synthase; SOD, superoxide dismutase. Radiation causes other types of damage. Formation of reactive oxygen species (ROS; free radicals involving oxygen) and reactive nitric oxide species (RNOS) induce stress responses, inflammation, and release of cytokines, growth factors and chemokines [28, 29]. The finding that ATM is also involved in protecting cells from ROS accumulation by stimulating NADPH production and promoting the synthesis of nucleotides for DSB repair  highlights the complex interplay between multiple molecular radiation responses. When radiation interacts with tissues, ionizations produce free radicals that damage DNA. Cells respond by undergoing cell cycle arrest to allow DNA damage repair. Most damage is repaired, but unrepaired damage causes cell death via necrosis or apoptosis. In general, cells do not die immediately after irradiation - death occurs after replication is attempted often after three or four cell divisions. Proliferating cells are more sensitive than quiescent cells to radiation-induced killing because they have less time to repair damage. Misrepaired DNA damage can cause genomic instability - cells can replicate but damage and cell kill can occur after many cell divisions - and cancer induction after many years. The genome of some people is more unstable than others and individuals with cancer-prone conditions associated with genomic instability, such as ataxia telangiectasia, tend to be radiosensitive. Tumors are more susceptible to the DNA damaging effects of radiation because the cells are generally proliferating faster compared with surrounding normal tissues. Also, because of the many genetic changes that occur in tumors they are generally less able to repair or correctly repair radiation-induced DNA damage. Figure 2 shows many of the important genes involved in cell and tissue response to radiation covering the mechanisms known so far. Until the last decade, DNA damage responses dominated research in the area and understanding the repair pathways continues to be a key area of research. There is increasing interest though in understanding the mechanisms involved in radiation-induced inflammatory and stress responses to ROS and this is also a key area of research. The latter is particularly important for understanding how radiation affects cells not directly irradiated - bystander cell killing . All patients receiving potentially curative radiotherapy will experience toxicity. There is variation in severity from minor to severe and in duration from weeks to a lifetime. Very rare extreme toxicity results in death and is usually associated with an undiagnosed radiosensitive genetic condition . There are several grading systems for recording radiotherapy side effects, with the common toxicity criteria for adverse events system being used increasingly. Toxicity is not generally documented systematically in routine clinical practice because it is too time consuming . Grading is generally on a scale of none, mild, moderate or severe, with some as either none or yes (for example, sterility following ovary/testes irradiation). Side effects are typically local occurring in irradiated sites and are numerous, variable and site dependent (Table 1). Acute toxicity occurs during or shortly after completion of treatment and is usually reversible. Acute effects occur in rapidly proliferating tissues as a result of cell death, for example, skin (erythema, dermatitis, desquamation, hair loss), intestine (diarrhea) and bladder (cystitis). Acute effects are generally manageable (for example, use of feeding tube for patients with head and neck cancer) and transient due to proliferation and repopulation by surviving stem cells. Late effects, manifesting months to years after radiotherapy, can be permanent and are dose limiting. An example is fibrosis, which can lead to obstruction of bowel or urethra following irradiation of tumors in the pelvis, and hardening in the breast following radiotherapy for breast cancer. Severe late toxicity impacts negatively on quality-of-life (for example, bowel incontinence) and can be life-threatening (for example, bowel obstruction). The long time course for their development prevents titration of dose against toxicity in individual patients, and the relationship between acute and late effects remains unclear [34–36]. The pathogenesis of late toxicity includes fibrosis, atrophy and vascular damage and the molecular processes involved are shown in Figure 2. Fibrosis represents an inflammatory-mediated proliferation response of surviving fibrocytes to growth factors, cytokines and chemokines released following irradiation . Atrophy (tissue shrinkage) reflects cell kill. The effects of fibrosis and atrophy include hardening and shrinkage of an irradiated breast or the development of strictures and malabsorption in irradiated small bowel. Vascular damage can cause small vessel dilation, manifesting as telangiectasia in the skin or hematuria (blood cells in urine due to bleeding) in an irradiated bladder. Alternatively, vascular damage can cause small vessel constriction, which manifests as ischemia and necrosis, and examples include bowel perforation and fistulae. Other important late effects include hormone deficiencies, infertility and, in patients with a long life expectancy, second malignancies. A challenge for radiogenetic/radiogenomic studies is to obtain cohorts of patients with good quality (that is, complete, longitudinal, including pre-treatment, and comprehensive) toxicity data along with other data on possible non-genetic risk factors (Table 2). Several factors influence the likelihood of a patient developing toxicity; these factors are broadly related to physics (for example, toxicity increases with increasing radiation dose and volume), concurrent treatments (for example, chemotherapy tends to increase toxicity), patient history (for example, patients with comorbidities such as diabetes and rheumatoid arthritis tend to suffer more toxicity, smoking increases toxicity) and genetics. The challenge for radiogenetics/radiogenomics is to quantify accurately the non-genetic risk factors so that the influence of genetics can be detected reliably. Radiosensitivity is a broad term applied to cells, tissues and individuals. Different cell types vary in radiosensitivity as do cells from different individuals. Some tissues are more tolerant of radiation because of their organization - if a small part of a lung is destroyed by a high dose of radiation, lung function can be maintained by remaining healthy tissue, but if a small section of spinal cord is damaged it can lead to paralysis. Some tissues are sensitive because they have a higher level of proliferation or undergo apoptosis. Individuals also vary in radiosensitivity and this can be associated with cellular radiosensitivity and/or genomic instability. Radiosensitivity is typically measured in research studies (not routine clinical practice) using cells (mainly blood lymphocytes or fibroblasts cultured from skin samples). Cells are irradiated and can be assayed using several approaches (Figure 3). The gold standard is a clonogenic assay, which is a sensitive method for measuring radiosensitivity over several logs of cell kill. Clonogenic assays assess reproductive integrity, that is, ability of single cells to form a colony with a minimum of 50 cells (representing at least five to six cell divisions) . Other assays are used to assess radiosensitivity: chromosome damage endpoints, DNA damage endpoints, apoptosis [38, 39] and cell cycle delay . Examples of chromosome damage endpoints are G2  and micronucleus  assays (Figure 3). An example of a DNA damage assay involves scoring radiation-induced gammaH2AX foci . Measurements of radiosensitivity in humans show the heritability of the trait (Table 3) and an approximate normal distribution (like other polygenic traits such as height) [41, 44] (Figure 3). Current understanding is that radiosensitivity is an inherited polygenic trait, dependent on the interaction of many genes/gene products involved in multiple cell processes . Measuring radiosensitivity. There are many assays for measuring radiosensitivity. The gold standard is a clonogenic assay where single cells are plated and allowed to grow for 1 to 4 weeks to assess ability to form colonies. (a) Colonies from fibroblasts cultured from a human skin sample. As it takes several weeks to culture fibroblasts and carry out a clonogenic assay, more rapid assays are often used. (b) An example of a more rapid assay is the G2 assay: a peripheral blood sample is taken, lymphocytes are stimulated to proliferate with the mitogen phytohemagglutinin, after 72 hours the cells are irradiated with 0.5 gray (Gy), and after 30 minutes colcemid is added for 60 minutes to arrest cells at metaphase that were in G2 when irradiated. The number of chromosome aberrations (arrows) is scored relative to unirradiated controls . (c) Another example is the micronucleus assay: peripheral blood lymphocytes are irradiated with approximately 2 Gy and incubated for 2 days, cytochalasin B is added to prevent cytoplasm division after mitosis, and cells are harvested after 1 day and the number of micronuclei per 100 to 1,000 cells is scored . Demonstration of cellular radiosensitivity in individuals with life-threatening radiotherapy toxicity or cancer-predisposing syndromes usually involves fibroblasts and derivation of radiation survival curves. (d) Survival curves for a number of individuals, including one (blue line) with ataxia telangiectasia, showing extreme cellular radiosensitivity. Parameters can be obtained from fitting curves to the data and parameters that reflect the initial slope, such as alpha and surviving fraction at 2 (SF2) or 3 Gy, are better at showing differences in radiosensitivity between people . (e) Normal (that is, non-syndromic) individuals vary in radiosensitivity with a distribution that is approximately normal . *Peripheral blood lymphocytes were used in all studies. The G2 assay involves scoring chromosome damage in cells irradiated in G2 phase of the cell cycle. The micronucleus (MN) assay involves irradiating cells and preventing progression through mitosis. Radiation-damaged chromosomes form micronuclei that are counted. Study of genetic syndromes associated with mutations in genes in DNA repair pathways provided the first insight into human variations in radiosensitivity. Ataxia telangiectasia, associated with mutations in ATM, was the first reported syndrome with extreme clinical (life-threatening radiotherapy toxicity) and cellular radiosensitivity . Other syndromes have been identified associated with mutations in genes involved in DNA recognition and repair, cellular radiosensitivity, genomic instability and cancer pre-disposition (Table 4). As NHEJ is involved in VDJ recombination (DNA rejoining process during T and B cell development), syndromes involving defective NHEJ genes are also associated with immunodeficiency. Several syndromes are associated with genomic instability and a high risk of radiation-induced cancers, for example, Li-Fraumeni (TP53) and retinoblastoma (RB1) , but cellular and clinical radiosensitivity are not generally seen . Other evidence comes from experimental data showing mutations in genes involved in DNA repair pathways increase cellular radiosensitivity, for example, the radiosensitive Chinese hamster ovary cell lines (gene mutated): irs1 (XRCC2), irs2 (XRCC8), irs3 (RAD51C), irs20 (PRKDC), IRS1-SF (XRCC3), xrs5 (XRCC5) and XR-1 (XRCC4) . AT, ataxia telangiectasia; NHEJ, non-homologous end joining. Other genes of interest are downstream effectors of cellular responses to radiation-induced damage, such as those involved in the control of apoptosis and cell cycling (Figure 2). Cells able to undergo apoptosis or having impaired cell cycle arrest following irradiation tend to be radiosensitive [49–51]. As ROS/RNOS are important (Figure 2), genes encoding antioxidants involved in free-radical scavenging are also implicated, for example, superoxide dismutase (SOD1), glutathione S-transferases (for example, GSTA5) and catalase (CAT), and germline genetic variations that predispose to increased levels of ROS may predispose to increased radiation toxicity . ROS/RNOS pathways are less widely studied than those involving DNA repair in terms of cellular and clinical radiosensitivity, but there is evidence that changing levels of antioxidants can alter cellular radiosensitivity [53, 54]. Cytokines such as transforming growth factor beta (TGFB1), tumor necrosis factor alpha (TNF), interferons and interleukins are also involved in the development of toxicity. For example, IL17 receptor knockout mice have enhanced myelotoxicity and impaired hemopoietic recovery following irradiation . There is now substantial evidence for the importance of TGFB1 in the pathogenesis of fibrosis following radiotherapy [28, 56]. In comparison with DNA repair defects, however, there is less evidence for a direct role in clinical and cellular radiosensitivity but the area has been less widely studied. Irradiated homozygous TGFB1 knockout fibroblasts were more radiosensitive than wild-type fibroblasts . However, patients with Marfan syndrome associated with mutations in FBN (fibrillin-1; increases interstitial fibrosis and TGFB1 activation in murine knockouts) undergoing radiotherapy showed no increased toxicity . It is an area requiring further study. Numerous studies have reported associations between genetic variation reported as SNPs in the candidate genes described above and radiotherapy toxicity (Table 5). However, most studies have involved only small patient numbers and no replication. The only replication study carried out failed to validate previous findings . The lack of independent validation for any of the SNPs studied makes it impossible to say with certainty whether any predispose a patient to suffer toxicity. Due to the generally small numbers studied and overestimation of risks associated with rare alleles, the studies have lacked the statistical robustness required for changing patient management [45, 60]. Gynae, cervix and endometrial cancer; No. risk alleles, number of homozygous rare and heterozygous alleles for the various SNPs studied; NSCLC, non-small cell lung cancer, SNP, single nucleotide polymorphism. With the rapid reduction in cost of genotyping, there is increasing interest in carrying out GWASs to identify new genes associated with toxicity. Kerns et al. recently reported the results of the first GWAS. In a study of African-American patients with prostate cancer, 27 who developed erectile dysfunction after radiotherapy were compared with 52 controls. The SNP rs2268363 in the follicle-stimulating hormone receptor gene (FSHR; involved in testes development and spermatogenesis) was associated with erectile dysfunction with a P-value that reached genome-wide significance (P = 5.5 × 10-8) and an odds ratio of 7.0 (95% confidence interval 3.4 to 12.7). Of course, we cannot state with certainty that the FSHR SNP is associated with radiotherapy toxicity until the finding is validated. Unfortunately many highly significant phenotype-genotype associations are found in GWASs but few are replicated because of a high level of false positives due to studying several hundred thousand SNPs, population stratification and genotyping artifacts . SNPs with rare minor allele frequencies and poor genotype call rates are unlikely to replicate . With the caveat that the findings require validation, the study of Kerns et al. represents an important first step for the radiotherapy community and it is interesting that the SNP possibly identified is tissue specific. Another recent study carried out a genome-wide screen of microsatellite markers in 360 patients with a variety of cancers and identified a marker in the promoter region of SEM3A (required for neuronal development) associated with acute radiotherapy toxicity . Again, there has been no confirmatory study but, as the gene had no previous known role in modulating radiosensitivity, the authors showed that siRNA knockdown increased fibroblast radioresistance . A third GWAS looked at 277 lymphoblastoid lines to identify SNPs associated with radiosensitivity measured in vitro. 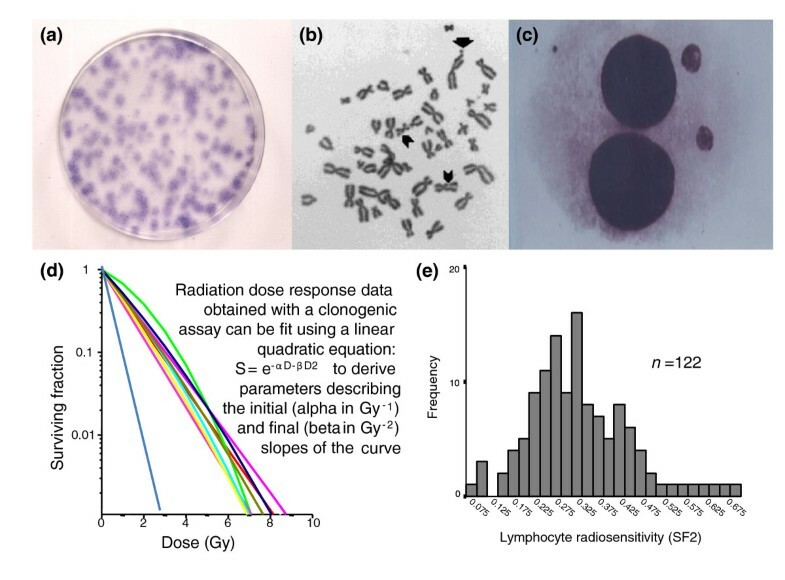 The work employed pharmacogenetic methods measuring viability after graded radiation doses (up to 45 Gy) and analyzed area under dose response curves to measure radiosensitivity, none of which is a standard radiobiology approach. The following genes were identified and suggested to influence radiosensitivity using siRNA (in tumor cell lines): C13orf34, MAD2lI, PLK4, TPD52 and DEPDC1B . The three GWASs described above all have their limitations; it remains to be seen whether the findings are validated and no firm conclusions can be drawn. However, they represent important first steps towards identifying genotypes associated with radiosensitivity/radiotherapy toxicity and in collecting the samples and data required that should eventually contribute to international pooled replication studies as other GWASs emerge in the next few years. It is interesting that the genes possibly identified in the three studies are not obvious radiation-associated candidate genes; this is consistent with current opinion that we have insufficient understanding of the molecular pathogenesis of radiotherapy toxicity as a polygenic phenotype. Information from GWASs of other phenotypes suggest the allelic architecture underlying radiosensitivity will include a spectrum ranging from rare, highly penetrant to low-risk common alterations . Although GWASs are currently only expected to capture a fraction of the genetic determinants because several hundreds of thousands of patients must be studied to identify variants with small effects, it is important that the radiotherapy research community work together to pick this 'low hanging fruit'. Such work is vital to ensure we have the samples and data to exploit new research strategies being developed to identify rare variants, for example, including populations with different ethnicity/founder populations where variants are more prevalent and studying structural variation (for example, copy number variants) . In 2011, the results were published of the first GWAS looking at radiotherapy-induced second cancers . The study involved individuals who underwent radiotherapy for Hodgkin's lymphoma as children: 100 cases and 89 cancer-free controls in a discovery cohort and 96 cases and 82 controls in a replication cohort. Two variants at chromosome 6q21 were identified implicating PRDM1 (also referred to as BLIMP1). PRDM1 encodes a transcription factor that acts as a repressor of beta-interferon gene expression to co-ordinate response to viral infection by regulating proliferation and differentiation. There are a number of interesting observations to make from the study. First, the implication that altered immune function increases the risk of radiation-induced cancers. Second, the effect sizes associated with the SNPs identified were higher than expected from observations emerging for other traits (per allele odds ratios of 2 to 4) . Third, although relatively few individuals were studied (compared with other GWASs) the findings were not only replicated but also confirmed in a functional assay. The high effect size was attributed to a strong genetic susceptibility with young age of radiotherapy as the contribution of genetics to cancer susceptibility is likely to decrease with age as environmental and lifestyle factors exert an increasing influence , which is also a likely explanation for the ability to use a small sample size. The increasing recognition that most GWASs must include thousands of patients [45, 60] led to the establishment of a radiogenomics consortium in 2009 . The consortium created an important link between existing collaborative groups [67–69] and other smaller consortia. The consortium should provide a route for sharing and developing expertise and quality assurance procedures, developing best practices for data collection, and pooling data and carrying out replication studies. There are many challenges in radiogenomics: (1) radiotherapy schedules vary between centers and countries; (2) recording radiotherapy toxicity is not routine and there are multiple scoring schemes; (3) there are multiple sites (for example, breast, head and neck, prostate) and multiple endpoints involved within each site (Table 1); (4) there is no consensus on the best toxicity time point to use (acute, 2 or more years); (5) there is no standardization of possible non-genetic risk factor data collection (Table 2); (6) more work is required to improve our ability to incorporate radiation physics data (the actual dose received by surrounding normal tissues); (7) we need to determine the best way of pooling data from multiple studies. A key advance in the area will be the standardization of data collection and further GWASs involving large cohorts. Studies measuring radiosensitivity to predict radiotherapy toxicity have used a variety of assays, yielded mixed results and there is currently no method suitable for routine clinical use that accurately assesses the radiosensitivity of an individual . There has been little standardization of the methods used and the approaches are varied in terms of samples (for example, blood, skin, plasma), timing (for example, before, during) assays (for example, clonogenic, DNA damage, chromosome damage, level of apoptosis assessed using flow cytometry, cytokine production assessed using ELISA, gene expression profiling, proteomics, metabolomics). A long-term goal of the research area is to develop a test that predicts the likelihood of a patient suffering side effects . Theoretical studies have shown that such a test should improve the therapeutic ratio of radiotherapy by allowing dose escalation in radioresistant patients . Predictive clinical models are being developed [71, 72]. These cancer type-specific or endpoint-specific models integrate clinical (for example, diabetes, age, smoking, hormonal therapy) and dosimetric (mean doses to critical normal tissues) to obtain an estimate of the probability of developing toxicity. The models can easily be extended to incorporate genotyping data. An example comes from Kerns et al. , where four SNPs identified in their GWAS were better at predicting erectile dysfunction than a combination of clinical factors (age, stage, radiation dose, hormone use, diabetes, smoking). However, the finding should be interpreted with caution, as predictive value is generally overestimated when the model is created and evaluated in the same study population, particularly if the same data were first used to select the strongest genetic predictors out of a large set of genotyped variants . GWASs are increasing understanding of the genetic variation underlying common traits and diseases and, in pharmacogenomics, are starting to identify genetic determinants of drug efficacy and adverse effects [74, 75]. Radiogenomics is an emerging and developing research area, and it faces many challenges surrounding the collection of sufficiently large cohorts with detailed recording of toxicity and information on non-genetic risk factors, which are not generally collected routinely. The GWASs of Kerns et al. and Best et al. are important because they are the first radiogenomics studies published, but the field will only advance with international data-sharing and methodology-sharing co-operation. The establishment of a Radiogenomics Consortium should provide a route for addressing the need for standardizing data collection, pooling data and replication studies. The authors would like to thank Drs Susan Davidson and Charlotte Coles for images in Figure 1. The authors' work is supported by Cancer Research UK. Dr Gillian Barnett is also funded by the Royal College of Radiologists and has received funding from Addenbrooke's Charitable Trust. CMW and GB contributed to the drafting of the manuscript. CMW carried out revisions and gave final approval of this version to be published.